Growing up, I was a huge Harry Potter Fan. I was that kid at the midnight releases of the books and midnight premiers of the movies decked head to toe in proper Potter fandom attire. In fact, when Zach and I began dating in college my roomates and I made shirts for one of the midnight release's and I'm pretty sure he thought we were crazy ha. Although now at 31, and two kids, he embraces my small obsession with the series. 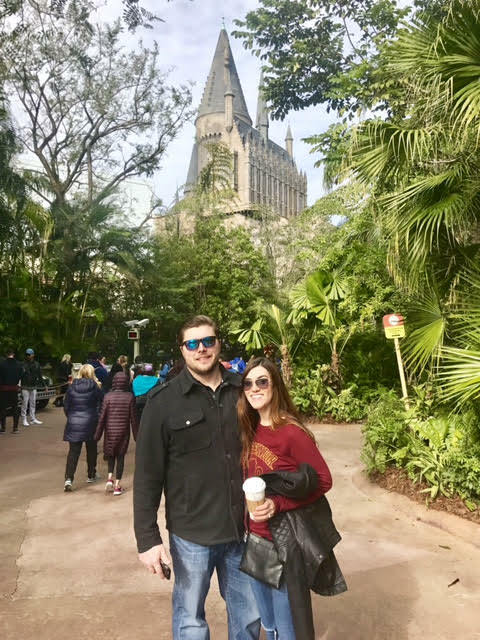 I had been begging my husband to take us to the Wizarding World Of Harry Potter for years but we were never really able to make it work until last weekend when he surprised me as a Christmas gift. To say I was shocked was an understatement because I don't think I could talk for a mere 5 minutes. I couldn't wait to go and not only share the experience with one another, but our good friends as well! When we first arrived I knew that everything was perfect. What truly makes the park stand out are the subtle references to the wizarding world while making everything magic come to life. 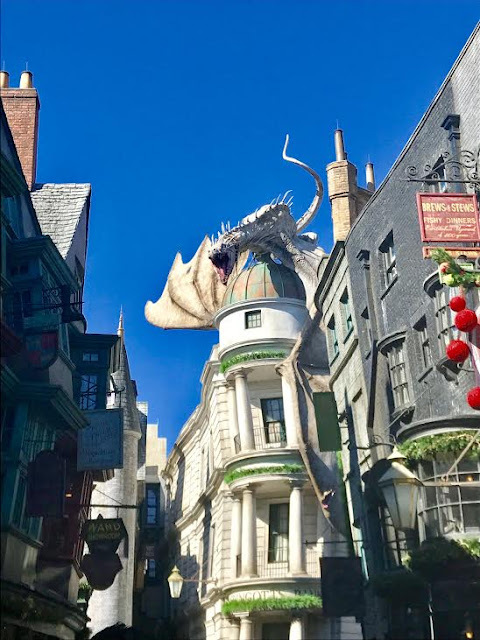 There are so many amazing things to see and do- both small ad big- but it's truly the Harry Potter world hacks that you need to look out for. 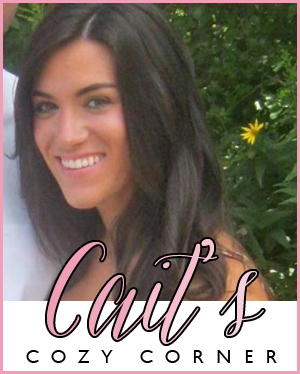 Here are a few tips on what to do when you're there ( and a few hacks! ). 1. Arrive Early - If you can, try to be at the park about 30 minutes before it opens! It's actually a super long work from the parking lot all the way back to the Wizarding World entrances, especially for us! Despite not even having our kids in tow, we booked it there and were excited to see and get a few great photos before the crowds started to set in! 2. 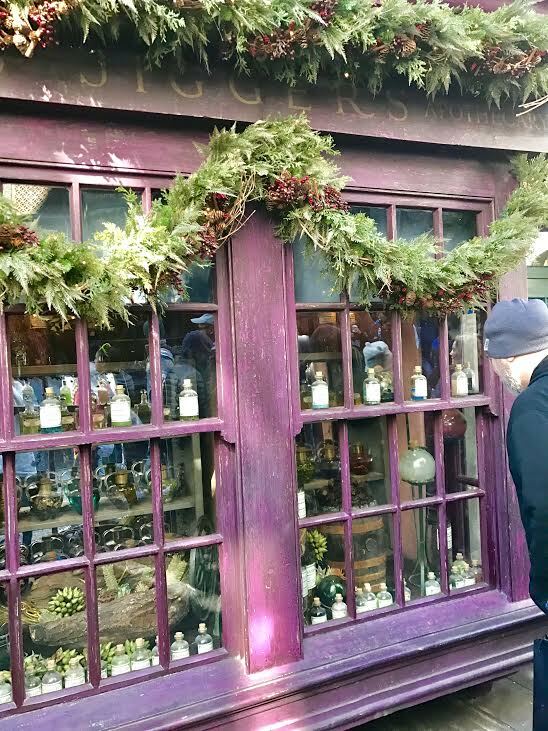 Ollivander's Shop - Plan on purchasing a wand. I think Zach thought I was crazy for wanting to spend $50 on a wand but the experience in itself is absolutely one of my biggest highlights. Head to Diagon Alley where the wait it is much shorter than the shop at Hogsmeade. The wand marker selects on person from each group and they are able to have a special experience of having a wand choose them, just like Harry does in "Harry Potter And The Sorcerer's Stone". 3. 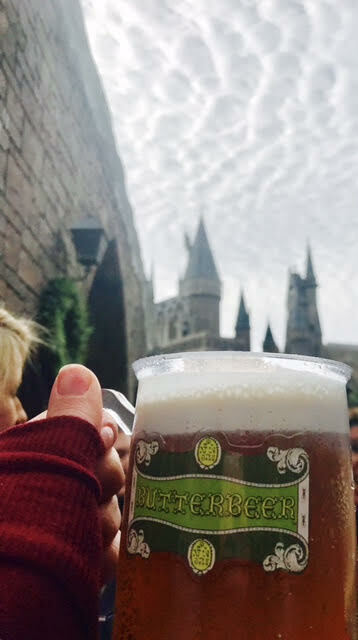 Try The Butter Beer + Other Drinks- I could not have been more excited to try this beverage. It's non-alcoholic and truly lives up to it's high expectation ( as I imagined Harmonie, Ron and Harry always sipping it when they were in Hogsmede ). It tasted like a rich, creamy cream soda! Worth every drop! 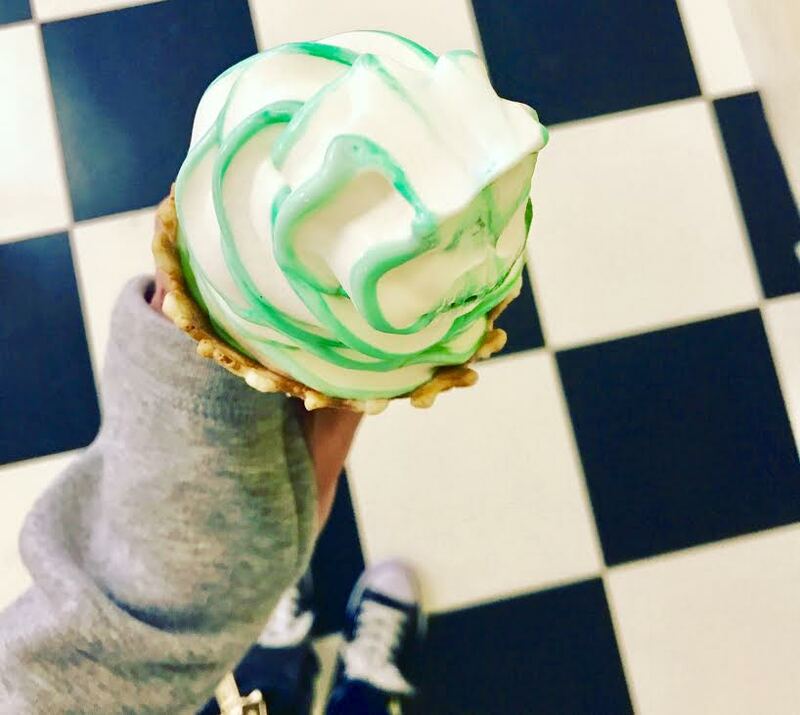 They also offer it frozen or ice cream form! Don't forget to at Hog's Head Pub they also offer Firewhisky ( a warm cinnamon that goes down pretty easy ) as well as Hog's Head Brew- made exclusively for Universal! 5. Ride The Rides - Personally, I'm not a roller coaster fan but everyone said these were a must to try! The Flight of the Hippogriff ( a roller coaster ) looked pretty fun but unfortunately the ride for Harry Potter And The Forbidden Forest was about 2 hours long when we got there so we decided to skip it. Despite it actually being a 4D ride, there special effects still have you spinning, twisting and twirling so be warned for those that are prone to motion sickness like myself ha. If roller coasters aren't your thing either, try the Hogwarts Express! 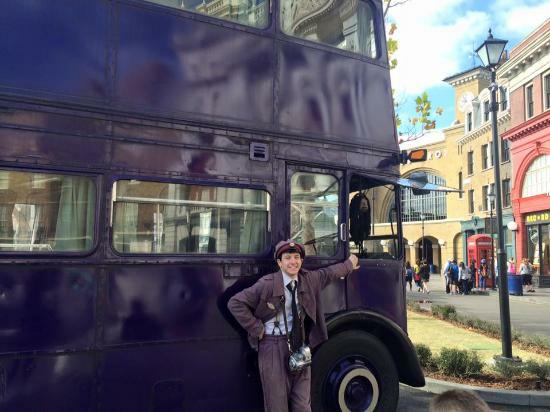 Hack: While on Hogwarts Express- you'll experience a variety of events such a a trolley lady offering snacks, a dementor invasion or familiar faces outside the window! Make sure you take it the Express both from Platform 9 3/4 to Hogsmeade and then back to Diagon Alley part of the park! You'll see different things happen depending on which direction you're going! 6. Bathroom Stop - Nothing is left unnoticed for even the restrooms are enchanted at Harry Potter World! We stopped in to use the facilities next to the Hog's Head Pub and I kept hearing the ghost of Moaning Myrtle splashing around in the plumbing and wailing her sad fate of not being able to enjoy herself. Poor Myrtle. 7. Take Lots Of Pictures - What's amazing about this park is that pictures are truly meant to be taken- and from every angle! There was nothing left of "Look over there!" and "Did you see that?" while paroozing this word. A fun hack- if you're at the phone boot in Muggle London, and dial 62442 ( MAGIC ) you can get the Ministry on the line! Worthy of a picture! 8. Interactive Wands Make It More Magical- To really get a true experience for both Hogsmeade and Diagon Alley, I knew I wanted a wand not just sentimental purposes but also because you can interactive with it throughout the park! 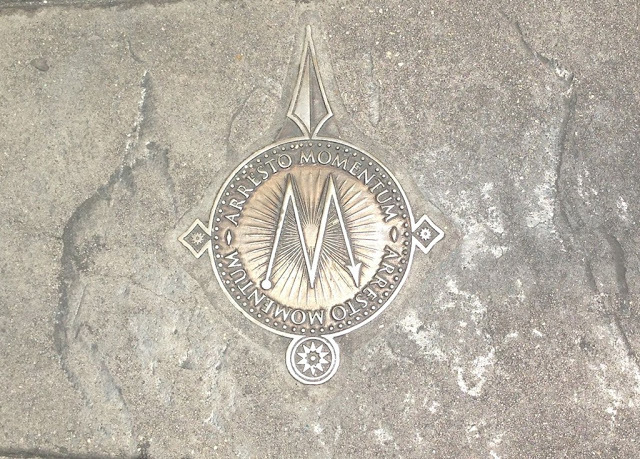 There are gold plates throughout the park with spell name and wand motions for casting it. The results- simply magically...literally! 9. Talk With The Characters - The workers at both the theme parks really know there stuff ( and stay in character! at every turn! We asked a few where to find Platform 9 3/4 and they huffed off as if they had no idea what we were talking about. Darn muggles! A few even challenged us to our Harry Potter knowledge. I admit I was a bit rusty at first but loved sharing my love for the series! 10. Soak It All In - This incredible world is absolutely memorizing so take time to see all the details that Universal Orlando created to put this experience in real life. 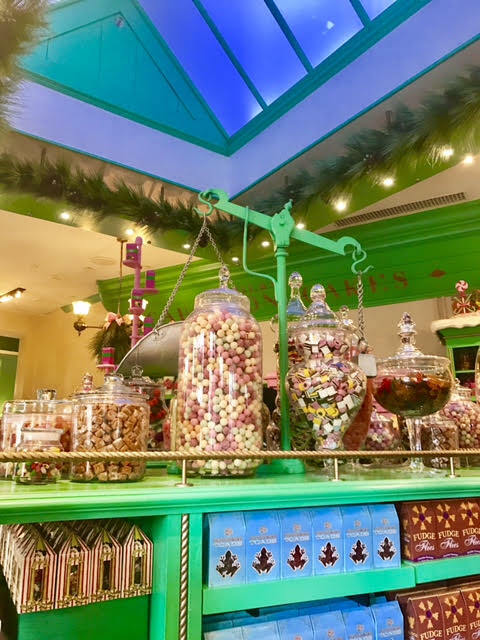 It was almost like a 'pinch me' moment everywhere I looked because I was loving hearing the kids talking to their parents about what fun they were having, seeing families slurp up their butter beer ice cream or talking about how they were selected to get a wand! 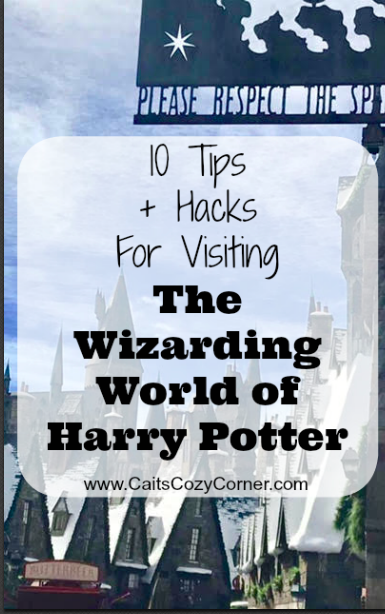 What are some tips you have for visiting The Wizarding World Of Harry Potter? 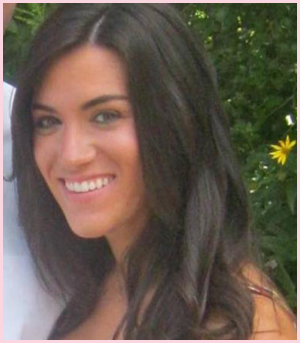 Such a great post, I went there for the first time last year and LOVED it! Totally agree about having butterbeer, it's so worth it!! Yay, love this! I'm going later this month for my 30th birthday and I'm so excited! I was just at Universal for HP World! Next time you go I would definitely recommend the single rider lines! You still might have to wait, but it seriously cuts down on time. Although going through the full line once (no matter how long it is) is still fun because they have it all set up with characters and movie shorts and details. My family always does the line once, and then single riders to ride it again! We have been wanting to visit for a while! I think we are finally going to next year, I'll keep these tips in mind for my visit! I need to go! I feel like so many of my friends have already been and I'm SUCH a huge Harry Potter fan. Granted, I got to go to London about a year and a half ago and do all sorts of HP things, so I can't complain to much. LOL But I do hope to be able to go sometime in the near future (not necessarily this year, but still...). Thanks for all the tips. I love that the bathroom is "in character" and I'd probably spend so much money buying things. I love the whole park based on this book/movie. I will not tell you I have never read the books or watched the movies. I think they could create more parks based on books and that would be so fun! I can't believe there is an actual WORLD dedicated to HP. I live in the UK so we have HP studios which I have been to and was thoroughly disappointed with. It looks like you had a GRYFFINDOR of a time!!!!! I am so jell! OMG you have me over here tryna book a trip!!! 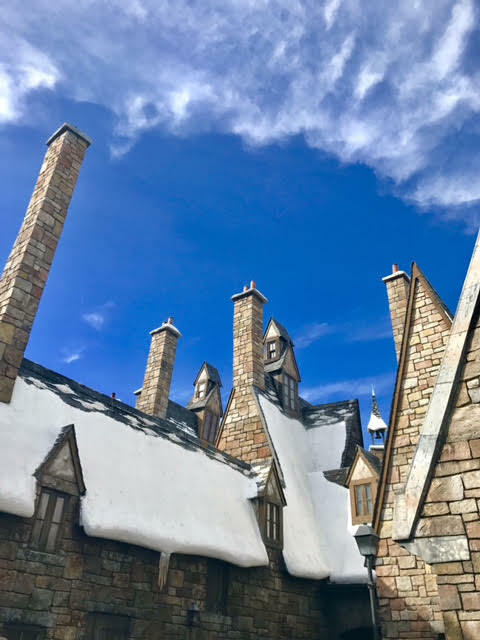 I went to Harry Potter World last January and absolutely LOVED IT! You hit everything that I loved about it. We didn't buy a wand, but I loved watching everyone else play around the park with them. Truly a magical place and you feel like you are REALLY THERE! Wow! 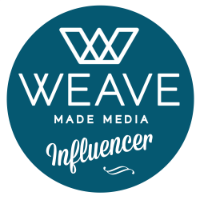 Such great info! I had no idea this even existed. My husband will be totally on board for this. I will have to look at planning a trip! Thanks for the great tips. 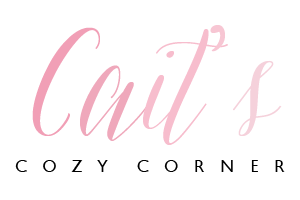 We are going to florida this weekend and I have been dying to make this one of my stops! I am so obsessed! Harry Potter World is on our bucket list and we're hoping that we can go when we go to Florida for our cruise in April. We're planning to go a few days before we board. But we shall see, I'll definitely be pinning this. 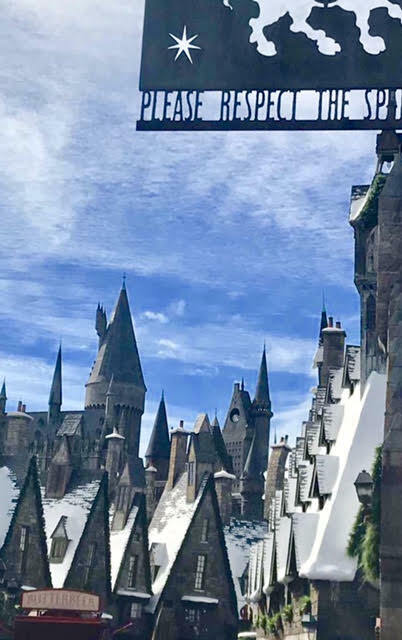 Great post, I am not really a huge fan of Harry Potter but I don't think you have to be because I still would love to visit this place and experience everything too. Thank you for the tips. These are some great tips. We were there in March but didn't stay in that area long since we're not really Harry Potter. But it was cool to explore! This is great, my husband has been really wanting to go. Love all your pictures and I’m saving this for when we go! Wow, it was truly magical, great to know of interactive wands which make this experience really full of magic. I would have loved to take those roller coaster rides, love them! Oh my goodness I love this! I really want to go and visit the Wizarding World of Harry Potter, but I don't know if I will every manage it so for now I live it through posts like this. I have always wanted to visit the wizarding world of Harry potter. I am not sure if I will ever make it but you make it look SO much fun. What a thoughtful gift from your partner, especially since he knew that growing up you were a huge fan of Harry Potter. I would definitely be up for going on all the rides that is for sure! These are great tips. We went 2 years ago but it was such a whirlwind. I don't think we saw even half of the attraction. I do think the Harry Potter town was very interactive and I wish to go again, but at a slower pace. Oh wow, would love so much to visit this place! So much fun and maybe magical tricks to learn! I bet that was so much fun. 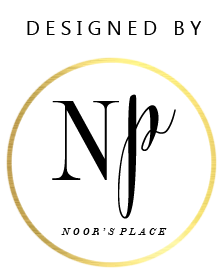 I have always wanted to check this place out. what a wonderful and thoughtful gift! I would love to go visit because I am a huge Harry Potter fan. I would definitely has a blast! It is one of my dreams to visit THE WIZARDING WORLD OF HARRY POTTER. I'll be keeping your tips in mind should we visit it soon. Amazing hacks. I went 6 years ago and definitely have to go super early! They have a smaller version at Universal Studios Hollywood that’s a load of fun but Harry Potter world looks just fantastic. Got to save up and visit! Absolutely loved the Harry Potter area at Universal! And this looks like a must visit too! I agree with your tips they are all amazing!Universal is an amazing place to visit.